Published 2010-04-15 in sections English, Mathe. 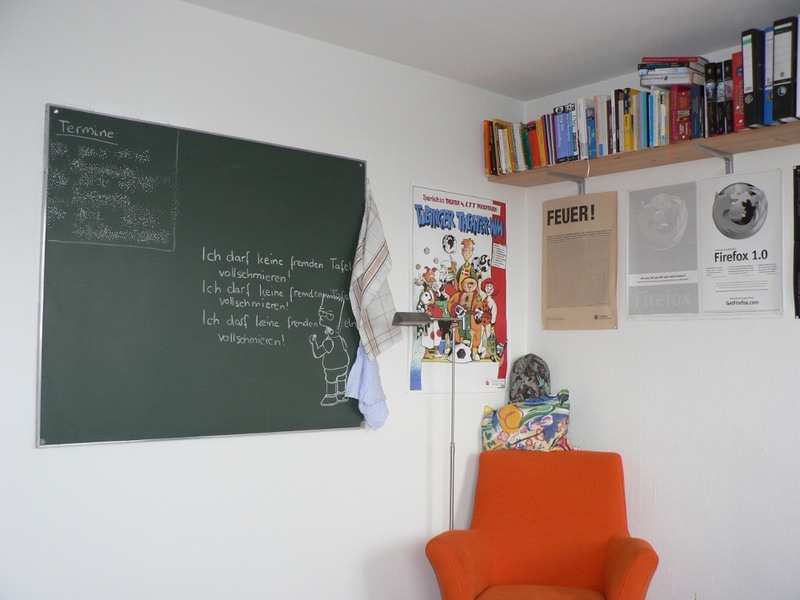 While writing my diploma thesis, I often wished I had a blackboard in my room: A place to quickly scribble some ideas on, somewhere where I can easily erease and replace stuff. Also, somewhere where you can literally (and not just figuratively) step back from and look at from the distance. Although my diploma thesis is finished, I’m sure it will be a nice and useful piece of furniture, and if only to draw funny things on (as my girlfriend did on this picture). Bart writes "I may no foreign vollschmieren panel". What does "vollschmieren" mean? Maybe you could teach Google translation the meaning of the word too. I tried putting a space in that word (in case it's one of those German combined words) and got "I can not lubricate external panel fully". Grats on the "green"board for your room. Correct, I planned to link it, but forgot.